Barack Obama's final speech in quotes. He came, He claimed and He conquered! Yes! Barack Obama was the most prominent torchbearer of the much sought after American Dream! But his dream run is now in its last stage, as he delivered his valedictory speech before an estimated 18,000 in his hometown of Chicago! 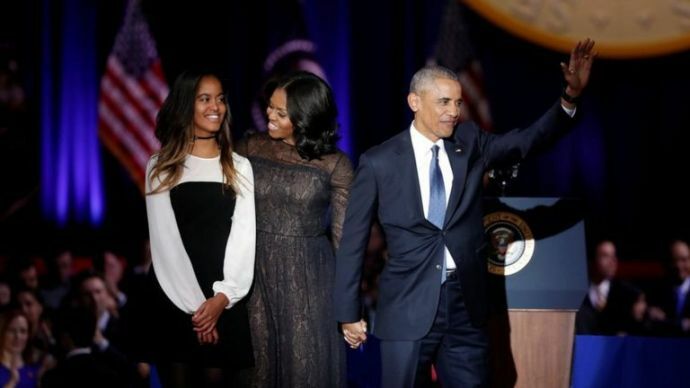 In choosing Chicago, Obama had earlier said he wanted to return to "where it all started" for him and First Lady Michelle Obama, instead of delivering the speech from the White House. 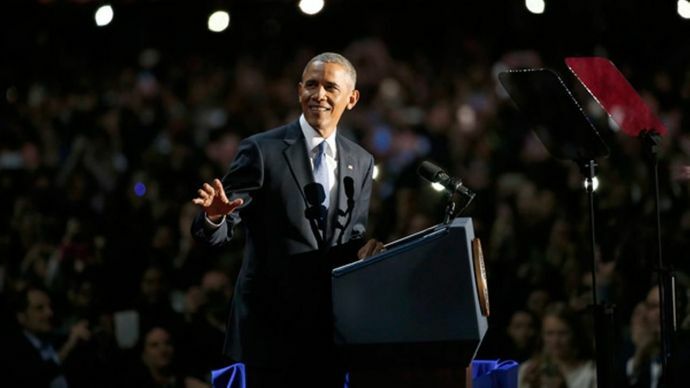 Raucous chants of "four more years" from the crowd were brushed aside by the president. "I can't do that," he said with a smile. US presidents are limited to two terms by the constitution. "No, no, no, no no," he said, when the crowd booed the prospect of Trump replacing him. One of the nation's great strengths, he said, "is the peaceful transfer of power from one president to the next." This messages were loud and clear as he spoke directly to supporters and opposers, men and women, children and adults! He spoke about the coming times, democracy, anti racism and his very succesful tenure as the head of the state. Barack Obama's final speech in quotes! After my election, there was talk of a post-racial America. Such a vision, however well-intended, was never realistic. For race remains a potent and often divisive force in our society. I've lived long enough to know that race relations are better than they were 10, or 20, or 30 years ago. If I had told you eight years ago that America would reverse a great recession, reboot our auto industry, and unleash the longest stretch of job creation in our history… If I had told you that we would open up a new chapter with the Cuban people, shut down Iran's nuclear weapons programme without firing a shot, and take out the mastermind of 9/11... If I had told you that we would win marriage equality, and secure the right to health insurance for another 20 million of our fellow citizens - you might have said our sights were set a little too high. "Yes, our progress has been uneven.The work of democracy has always been hard, contentious and sometimes bloody. For every two steps forward, it often feels we take one step back." But he maintained his faith in America had only been strengthened by what he's witnessed the past eight years, and he declared: "The future should be ours." Michelle LaVaughn Robinson, girl of the South Side, for the past 25 years, you've been not only my wife and mother of my children, you have been my best friend. You took on a role you didn't ask for and you made it your own with grace and grit and style and good humour. You made the White House a place that belongs to everybody. 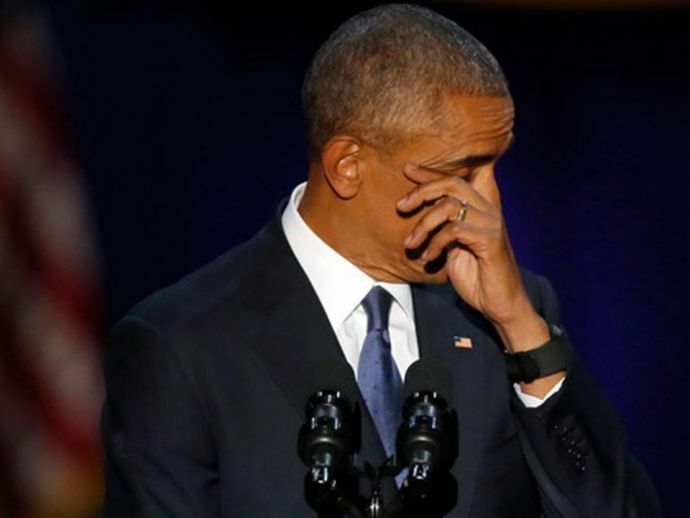 Brushing away tears with a handkerchief, Obama also paid tribute to the sacrifices made by his daughters, who were young girls when they entered the White House on Pennsylvania Avenue and leave as young women. Obama accomplished a mountain of goals during his two terms - from health care transformations and environmental regulations to his nuclear deal with Iran. Some might not agree, but even as Obama seeks to define what his presidency meant for America, his legacy remains unquestionable. The bottom line is that the world will miss Obama! I am a few million things! Rooted in family and friends, wanting to transform and excel! Engineer by choice, writer by passion. I am an artist, I may daresay, 'cause painting my own world with words is what I am really keen about.